This dramatic monologue from the young man Theseus in Jean Baptiste Racine's play Phaedra runs 1-2 minutes. My family to make them fly before me? By savage beasts that lapped the blood of men. Embrace rejected, and a hasty flight. Would I were still a prisoner in Epirus! Phaedra complains that I have suffered outrage. Brought useful aid, sheltered the criminal? Dear son, confederate with mine enemies? I'll enter. This suspense is overwhelming. And Phaedra must explain her troubled state. This monologue is easy to download and print. 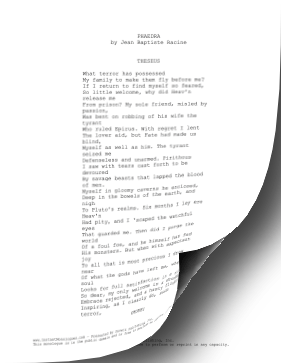 The PDF version can be printed using any PDF viewer; the DOC version can be edited in any word processor. Do you struggle to memorize scripts? We recommend Rehearsal Pro for iPad/iPhone. If you don't see a monologue type or category that you want, please take a moment to let us know what you are looking for.